What Day Of The Week Was October 5, 1986? 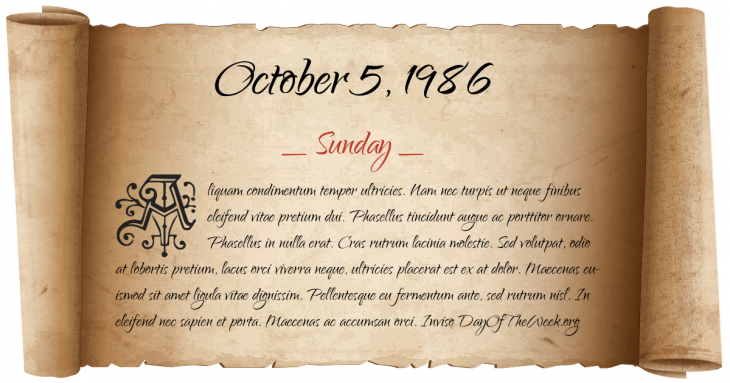 October 5, 1986 was the 278th day of the year 1986 in the Gregorian calendar. There were 87 days remaining until the end of the year. The day of the week was Sunday. A person born on this day will be 32 years old today. If that same person saved a Quarter every day starting at age 7, then by now that person has accumulated $2,332.00 today. Here’s the October 1986 calendar. You can also browse the full year monthly 1986 calendar. Israeli secret nuclear weapons are revealed. The British newspaper The Sunday Times runs Mordechai Vanunu’s story on its front page under the headline: “Revealed — the secrets of Israel’s nuclear arsenal”. Who was born on October 5, 1986?